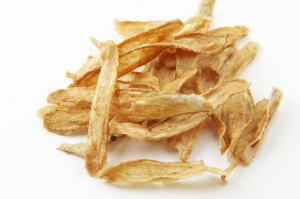 Gobo Chippusu ('ごぼうチップス', is classified into deep-fried food), is known as Burdock Chips in English, and 炸牛蒡片 (Zhà niúbàng piàn) in Chinese. Burdock Root Karaage, Gobo Karaage. Burdock, Salt, Potato Starch, Oil. Wheat Flour, Garlic, Soy Sauce, Pepper.